I cannot express the comfort I feel sitting beside the fireplace at the end of day. Whether it’s with a book, my knitting, or a cup of something warm, my heart melts, and I’m warm all over. A dear friend told me that a fire is just like any relationship, especially marriage. It needs tending, attention, and sometimes a little boost, prodding and adjustment. I do think I’m pretty good at tending our home fires. I continue to be happy we switched to wood-burning, and I love the twinkle in my family’s eyes when we gather around the fire. May you be inspired and not left in the cold on those rainy days. I’ll let you know how ours turns out! After promising myself I would get started in July, I’ll have to settle for starting in October. The first gift gives me practice at switching colors while knitting, which will be good preparation for another scarf of many colors and great length. 🙂 Other gifts this season will include pottery, quilts, sewing and baking as we continue in developing our tradition of handmade gifts and quality time together. I hope for you much the same in the upcoming season. 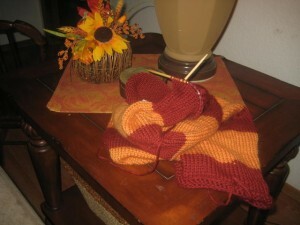 I highly recommend the double-layer scarf done on the circular needles. There’s something highly comforting about knitting every row; it’s downright meditative. If I don’t think it will give the gifts away, I’ll share photos of other gifts as they’re in progress. I Never Thought I’d do this . . .
Remembering, of course, that I’m a most mild-mannered person, the realm of things I never thought I would do is rather broad. Even some things I thought I would do remain undone, and this isn’t a bad thing. My life is full of potential! I never thought I would cut my own hair, let alone my daughter’s, into a very short cut . . . using clippers. But this I have done. I continue to cut my own hair short for convenience, cost, and practicality. 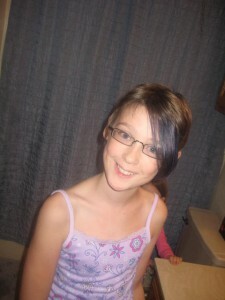 Cutting one’s hair isn’t a big deal, really, but I never imagined cutting and then dyeing my daughter’s hair blue, especially not just the little bit up front that we left long enough to tuck behind her ear. This, too, was done, and most likely will be done again. 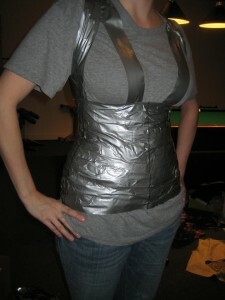 that advise using duct tape to get the form/pattern needed. This is definitely a project to be done with someone you trust, and it is incredibly funny. Left alone, I think it would also make for a great superhero garb. 🙂 She didn’t have to consent to a photo, but I’m glad she did. I hope your fall time has brought such creative exploration and new experiences. I’ll look forward to sharing the many projects that this coming Christmas season promises. Have you thought about how or when you use this phrase? When I say “easy does it,” I really mean, slow down, do this slowly and carefully, and don’t rush it. I only ever use it in the circumstance of some physical exertion. If I think about what it says . . . what does it really mean? Julia Cameron makes a case that it means if you show up daily to your artist’s work, do a little at a time, don’t obsess about it, don’t become all-consumed by it, then you will get it done eventually. Taking it easy gets the work done. If I apply my meaning of the phrase to artistic endeavors, I mean the same thing. Slow down. Don’t rush the process. Show up to do the work and let the creativity flow through you. This doesn’t mean that every time we take time to do something artsy that it will be brilliant, but it also doesn’t imply that we have to be in the “mood” to create. The more we create, the more we make ourselves available as creative channels, the more likely we are to have the strokes of “brilliance” and to see the Divine reflected in our works. Days or years later when you reflect back on your work, you might be amazed that you really did that, that you really were a channel of the Divine, of Spirit, of Creativity. Twenty minutes a day, consistently if you can. Be open. Have fun. Let’s give Creativity some room to move. In the women’s spirituality group I help facilitate, we’re doing what I guess you could call a series on spiritual tools for the journey. These are a few things that, along the way, I have found to be beneficial to me for hearing the inner longings of my soul. particularly vivid and significant then for me). After documenting the dreams, I pull out the Gratitude Journal (idea from Sarah ban Breathnach’s Simple Abundance). I list at least five things for which I’m grateful, and these range from people to things to ideas to states of being. Lastly, there’s the “morning pages” (term coined by Julia Cameron in her Artist’s Way books) where I vent/muse/list/write for a while. The goal is three pages, but sometimes three short paragraphs is all I have time for. Some days the whole process takes about 15 minutes. I’ve been known to take two hours. Collage This is another process inspired by Cameron’s Artist’s Way. My partner in spiritual direction and I use this tool frequently to either find where we are in the present stage in our lives or to help visualize what it is we want or need. Collages can be done given a prompt, given a time frame or given nothing but freedom of expression. Most recently, I collaged a manila folder, and it will store items in it particular to this phase of my life. Movement When our mind and spirit are expressed through the movement of our body, when the energy is released, I anticipate great things happening. This is an area that I hope to explore more in the future. I hope to learn t’ai chi. I have another woman leading this session this week, and I can’t wait to see what we do, how it feels. Honoring my body, caring for it well, is something I have to work on, but if our body is not well, we are not available to others, let alone to ourselves. Maintaining a balance and allowing the energy to flow freely improves our overall well-being. Meditation I was first introduced to sitting meditation (zazen) through a Buddhism class in college. For this, I am ever grateful. I went back many times to the Monday night “Journey into Silence.” I met wonderful people there, though the truth is we didn’t talk all that much. 25 minutes of sitting, 10 minutes walking, 15 minutes of sitting was the schedule, if I recall correctly. Truly, there are many forms of meditation, and I won’t list technique here. The point is silence. Prayerful listening. Stillness. Quiet mind. As busy people, sometimes we don’t have hours to sit in prayer to receive guidance, to experience the presence of God, but we can bring a mindfulness into our present task. 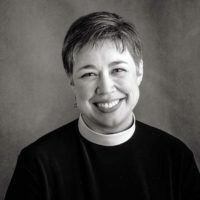 We can do things with a full-bodied awareness that embodies stillness and with prayerful listening be able to hear the still, small voice of Spirit or to experience the joy and gladness of doing the right thing at the right time. These are just a few of the tools that I use, some more regularly than others, of course. I encourage you to find what you use to express yourself creatively, what helps you hear the inner voice, what helps guide and assure you in your journey, and make it a regular practice. You are only too busy if it is not a priority. If finding what you are supposed to be doing is a priority to you or if you want clarity on anything, you have to be still and honest with yourself long enough to glimpse the truth of the matter. This isn’t easy, but the rewards are great. I’ve been wanting an awesome shirt pattern. I was catching up on one of my fave blogs, and saw the shirt! Leave it to SouleMama (who also has some great photos, as ever). She got the pattern from the book Weekend Sewing, which I’ve seen before, recommended on Sew, Mama, Sew. I may have to pick it up at our local bookstore sooner than later. host a blessingway, and I printed the program on vellum, attaching it to pretty printed paper with flower brads. make a couple of beaded necklaces (literally, I just made 2-4, while the other two ladies did about 12 each!). When it comes to crafting, our projects don’t have to be large or perfect. It’s taking the time to release some creative energy for the sake of doing something good. That’s all. May we all take more time to do some good things. Nothing Like a Deadline . . .
I’ve been wanting to do more sewing, more crafty projects, but my allocation of time lately hasn’t coincided with that desire. Enter Facebook and the “I will make something . . . for YOU” note. An excellent idea for those that need a little motivation to exercise that crafty side of the brain. Truth be told, we could just challenge ourselves to do that regularly. Pick a random five or so people you know and send them a spontaneous gift in the mail or a meal to their door. Radical hospitality or a random act of kindness, any way you look at it, it’s a good thing. A word of caution, however, is due — acts of kindness boost feel-good endorphins. I couldn’t turn my commenters away. Not only did I sign up to make five things, but I agreed to 10! I love a challenge. I love to give. I love to create. It’s a win-win-win situation. Now, to manage my time. I have the rest of the year to surprise myself. I never fail to be inspired by SouleMama‘s blog, and I can’t wait to lay my hands on her books. It was through her site recently that I found about about something good for us all, and better yet, it’s free! has some art to download and print and paste wherever you need a bit of art in your life. I adore the March download, and I hope you’ll enjoy, too. It’s looking like the weather is going to pull us indoors the next few days — the perfect time to kick back and get crafty. I may just finish a project or two, and it’s never too soon (or too late!) to work on a book idea. I hope your day is as beautiful as mine has been. Just when I’m thinking I need to be reducing my wheat/gluten consumption, my husband’s passion for flour-based foods finds yet another outlet — Artisan Bread in Five Minutes a Day. No, he doesn’t have it down to five minutes — yet. Yes, it is delicious, and he’s just getting started. He’s already made this concept of bread at least six times, one of which included making four (or was it six?) baguettes! When it comes to food, bread is about as basic, nourishing and nurturing as it gets. Sharing with others makes it even better. So, if you happen my way, don’t be surprised if I offer some bread — that is, if the kids haven’t eaten it all. Now, we’ll have to see if we can bake it in the outdoor oven without burning it! Not long ago I posted about having strangers over for dinner, which still lingers in my mind as a weekly possibility but hasn’t been acted upon yet. I’ve just learned about another mealtime event that will not only fill your own belly but also help others, too. You can have organic/local/healthy meals either catered or potluck. You could serve a meal in your house and charge per plate. You could have a large potluck and pass a bowl around to collect what others are willing to give. The possibilities are many, and the potential is great. Our local Earth Scouts are hoping to host one in April. Join the FaceBook group or Yahoo!Group to keep informed about upcoming events in Earth Scouts. Would you be willing to give?